NEW STYLE - Soft and Strong Hold 1.5" (40mm) hair elastics that are gentle on your hair and great for working out and all-day wear. STRONG HOLD - Hair ties will hold hair well and will wrap around medium to thick hair 2 times and fine hair 3 times. THICK HAIR - These hair ties will wrap around thick hair 2 times and you may be surprised by how well they hold thick hair! NO-SNAG - Seamless nylon and elastic hair ties with no metal won't snag or damage your hair. 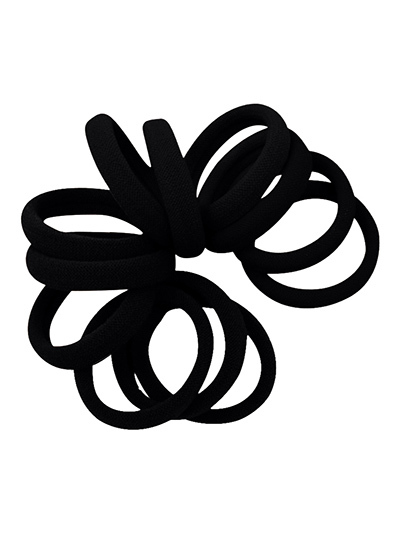 CLASSIC COLOR - Get a total of 12 hair ties in black. Soft and sporty seamless fabric elastic hair ties in the quality you expect and the colors you love from Cyndibands.